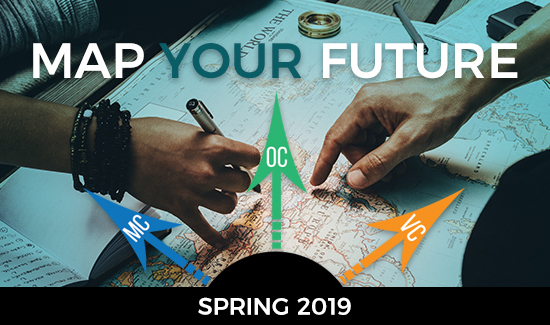 Attend Moorpark, Oxnard, or Ventura colleges to get the classes you need. Log on to the student portal for your registration date. The College Ride Pilot Program allows college students enrolled at Moorpark College, Oxnard College, Ventura College, CSU Channel Islands, and Cal Lutheran University to get around Ventura County FREE on public transportation- just show the driver your student ID. The pilot program launches continues through the 2018-19 academic year. Questions? $1,567 per class compared to a private university. Log on to the student portal for your registration date. Click on the links below for more details on fees. Accelerated Classes Available. Check the class schedule for details on start dates. Financial aid professionals serve students by providing information to secure the necessary financial resources to meet a student’s educational objectives. Many financial aid programs are available and vary in eligibility criteria, award amounts, and repayment options. The types and amounts of financial aid awards are subject to availability of funds, eligibility for funds, enrollment status and financial need; financial aid professionals assist students throughout the financial aid process. Check with your college Financial Aid Office for the most current information about the financial aid opportunities available to you. To be considered for financial aid, students should complete the Free Application for Federal Student Aid (FAFSA) or the California Dream Act Application for each academic year. A college counseling department provides essential support to a diverse student population and provides a variety of resources to current and prospective students. Counselors serve students and help a student reach educational goals. Areas of assistance may include helping a student match a major or career choice to their values, interests, and abilities; personal counseling; and assistance with completing a student’s educational planning process. Counselors are specialists in their academic and vocational areas and also teach classes to facilitate personal and career exploration and development, as well as academic survival skills. Individual and group counseling sessions are designed to review educational plans, career interests, and personal concerns, as part of the process of making meaningful life decisions. Counseling services are available during the day, evenings, by appointment, or drop-in basis. Contact Counseling Services to help you achieve the greatest possible benefit from your college experience. Our goal is your educational success and we offer a wide range of student services at each campus. Need to map out your educational plan or get advice on what classes to register for? Need a little help with homework? Planning to re-enter school following your military service? Each campus has a Veterans Resource Center to assist you and navigate you through the registration process. Play a sport or watch your favorite college team! Wondering how you are going to pay for college? Feeling a little under the weather and need to see a nurse on campus? Check out the childcare center if you want to take a class - we can help you with childcare. Need a book? Check in at the campus library. Want a little balance with classes and social activities? Check out the club pages and pursue a new interest or make some new friends.